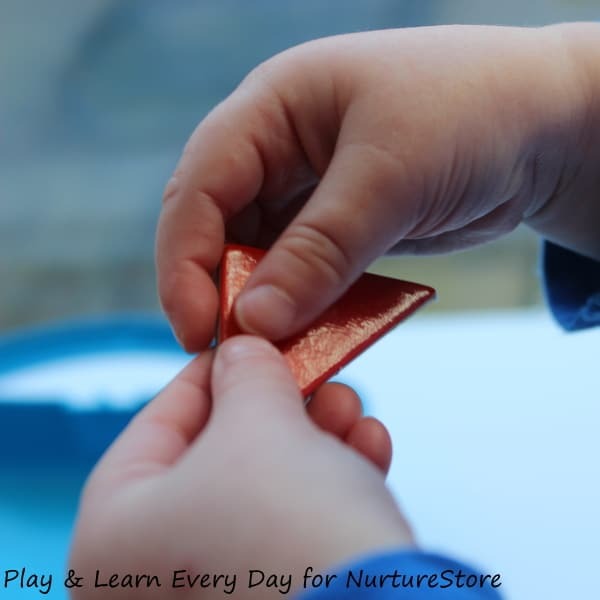 Niki from Play & Learn Every Day is joining our ABCs and 123s number and letter series today with one of those perfect simple / clever ideas that anyone can try. Here’s how to play a shape guessing game, with children of all ages. Learning shapes can be one of the easiest or most complex skills for a toddler, depending on whether they are a visual learner or not. Ethan (now 4) took quite a while to grasp the different shape names, whilst his younger sister Ivy (2 years old) is quite confident with the basic shapes already. We love to have fun while we’re learning and Ethan absolutely loves to play games, so the perfect choice for helping him to reinforce his shape knowledge is to play a guessing game. 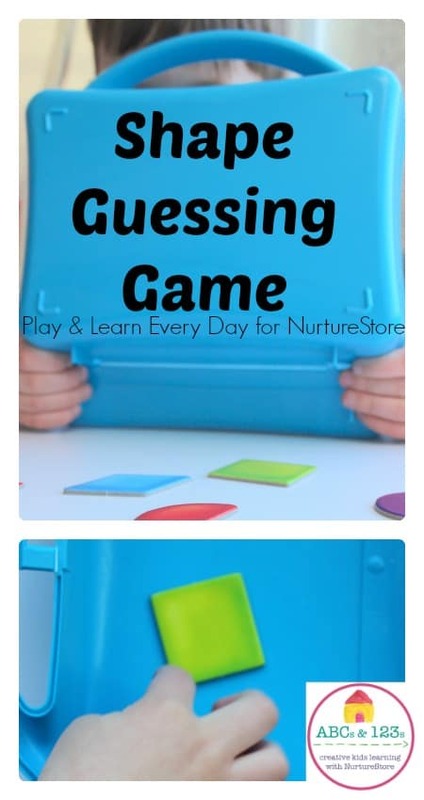 This game is so easy to set up but is beneficial for children in so many ways. I love it because it can easily be differentiated for varying ages and abilities of children, in a way that we can all play together. This can be done by using fewer simple shapes for young toddlers like Ivy, and adding more complex shapes for older children. To play the game we simply set the shapes out on the table, I used some shape cut outs from a board game, but you could easily make your own shapes from paper or use plastic or wooden shapes if you have them. Then the first player holds the box, we used a lunch box with a lid that can be held up to shield the chosen shape, and the guessing player covers their eyes while they choose a shape and hide it in the box. The guessing player then needs to ask questions about the shape to try to guess what it is. These can be questions about the number or sides, number or corners and size of angles, or fun questions about if it’s the same shape as a real life object (eg. Is it the same shape as a pizza?) They continue asking questions until they are ready to guess which shape it is. Once they get it right, then the players switch roles. We left all of the other shapes that were not chosen in the middle of the table, which also helped to make the game a little bit easier as they could be used as a memory tool to see which shape was missing. 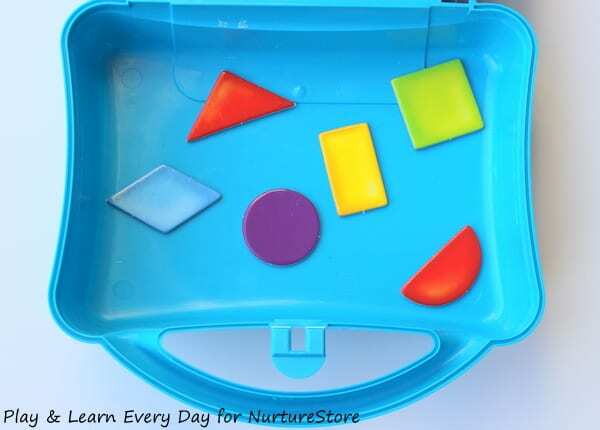 After playing a few times these shapes could be put in a bag or taken away so that they can not be seen to create more of a challenge. This was great for Ethan as it helped to reinforce his knowledge of the properties of the shapes, as well as helping him to describe and ask questions about them. The shapes that we focused on primarily were square, rectangle and diamond as they are similar in having the same number of sides, so require more investigation to work out which one it is. By the end of the game Ethan could confidently tell me that rectangles have 2 longer sides, which makes them different to squares with 4 equal sides. Ivy was not left out as for her level we played it as a pure guessing game. I would hide a shape and she would name different ones until she came to the correct choice. This reinforced her knowledge of the shape names and being able to recognise them. 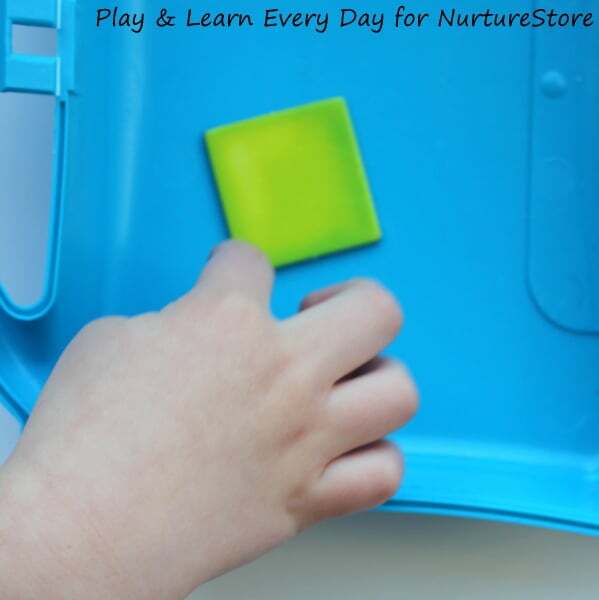 For older and more capable children this game could be extended by using more shapes (pentagon, hexagon, octagon) as well as 3D shapes and by hiding all of the shapes in a bag, which the child has to choose from without peeking. If you’re looking for a way for babies to get in on the shape exploration, take a look at our Shapes Treasure Basket. 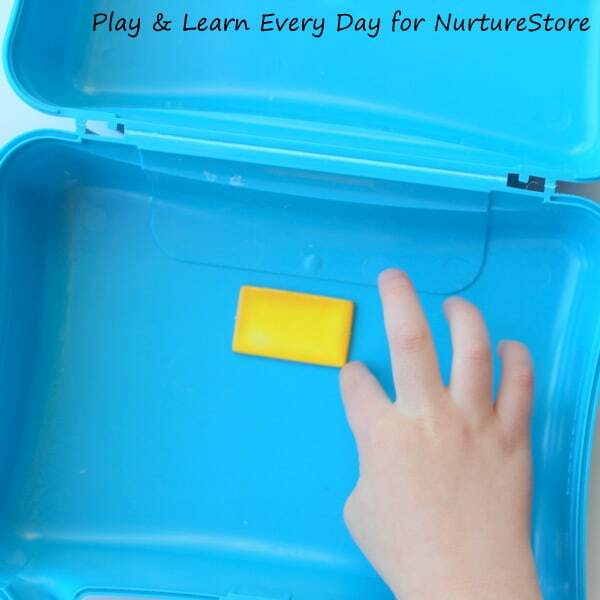 For learning to draw shapes this Sensory Writing Tray would work really well. 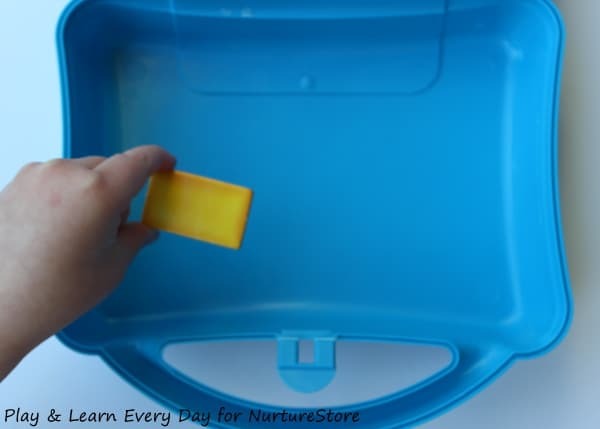 Or for some relaxing sensory fun after all that shape work, check out this Quiet Time Sensory Bin. Niki is a former teacher and current stay at home Mum to her two children; Ethan (4) and Ivy (2). Originally from Canada, Niki has lived in the UK for the past 13 years. 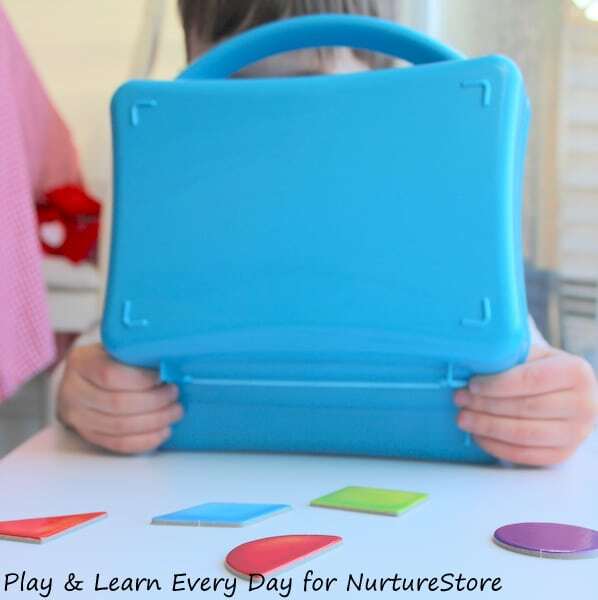 She writes about learning through play with games, activities, crafts and fun over on Play & Learn Every Day! What a brilliant activity. It must get them to listen and concentrate too! Yes, I think it’s super! I love how it’s so simple to set up, and good for different ages.